John found his passion for cooking while working with Chef Neil Annis at Restaurant Sidney at the age of 16. Upon graduation he left Pennsylvania and traveled to Charlotte, NC to be a part of Johnson and Wales Universities’ inaugural class. John continued to develop his culinary expertise as a sous chef at the esteemed Sanctuary Hotel on Kiawah Island. 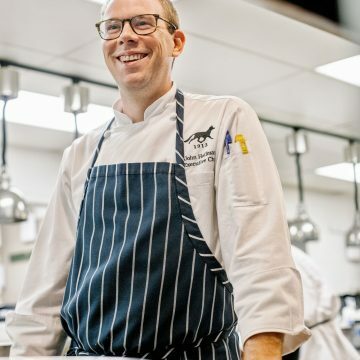 John and his wife returned home to central Pennsylvania, where he assumed the role of Corporate Sous Chef for Hershey Entertainment and Resorts. In April, John made the move to Virginia joining the culinary team at Keswick Hall and Golf Club as Executive Chef.